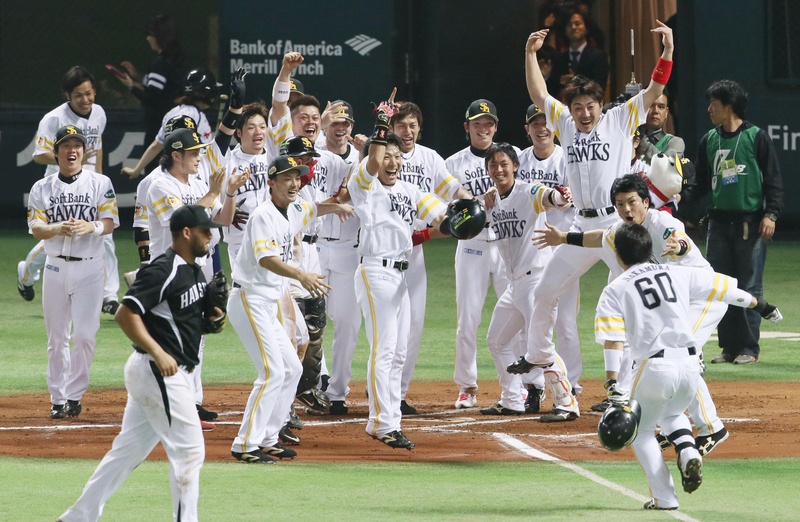 FUKUOKA - The Fukuoka Softbank Hawks celebrated like they had won a championship after Akira Nakamura’s home run cleared the fence and ended Game 4 of the Japan Series. If they rush the field like that again, it’ll be for real. 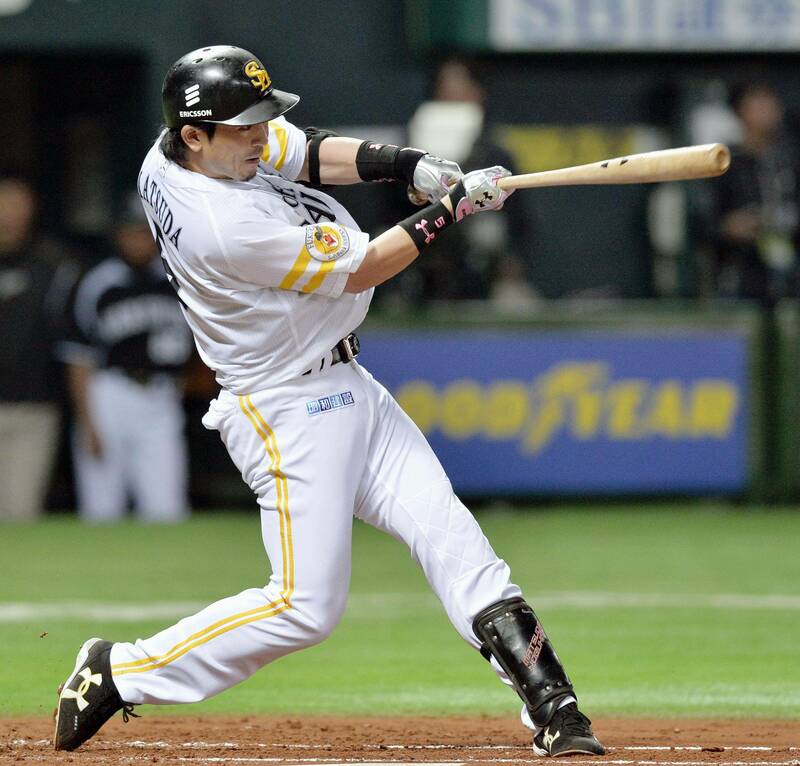 Nakamura took Hanshin Tigers closer Oh Seung-hwan deep to right for a sayonara three-run home run in the 10th inning that gave the Hawks a 5-2 win and moved them to the brink of the championship on Wednesday night at Yafuoku Dome. Softbank leads the series 3-1 and can capture the title with a home win in Game 5. 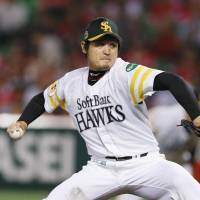 Tadashi Settsu was scheduled to take the mound for the Hawks, with Game 1 winner Randy Messenger named as the Hanshin starter. 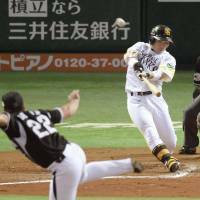 Softbank pushed across two runs in the first inning, Hanshin answered with two in the third, and the teams were still even entering the 10th. The Hawks’ Kenji Akashi drew a walk to begin the inning. Tigers reliever Yuya Ando retired Seiichi Uchikawa for the first out, but an ill-timed miscue put the Tigers in a bad spot. Yuichi Honda, batting in the four-hole because of an injury to slugger Lee Dae-ho earlier in the game, laid down a sacrifice bunt to advance the runner, but instead of taking the sure out at first, catcher Akihito Fujii opted to try and force out the speedy Akashi at second. The throw wasn’t in time, leaving the Hawks with runners at first and second with one out. Hanshin manager Yutaka Wada summoned Oh out of the bullpen at that point, and the Korean hurler retired Nobuhiro Matsuda for the second out of the inning. That brought Nakamura to the plate, and he brought most of the 35,861 in attendance to their feet with his game-winning blast. The Hawks can claim their second Japan Series title since 2011 with a win on Thursday. 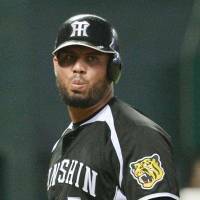 A loss would mean a return to Hanshin’s Koshien Stadium for a sixth game, and possibly a seventh. The game will be the last home contest for Akiyama regardless of the outcome. The 52-year old has already announced his intention to step down after the series. Dennis Sarfate normally closes games out for Softbank but was tasked with holding the Tigers at bay in the top of the 10th. Sarfate, who finished the regular season with 37 saves, gave up a single to Tsuyoshi Nishioka to begin the inning. Hiroki Uemoto laid down a sacrifice bunt and Takashi Toritani single and just like that, Hanshin had runners on the corners with no outs. Sarfate wiggled free from the jam with a forkball to Mauro Gomez that led to a 5-4-3 inning-ending double play. He ended up as the winning pitcher. 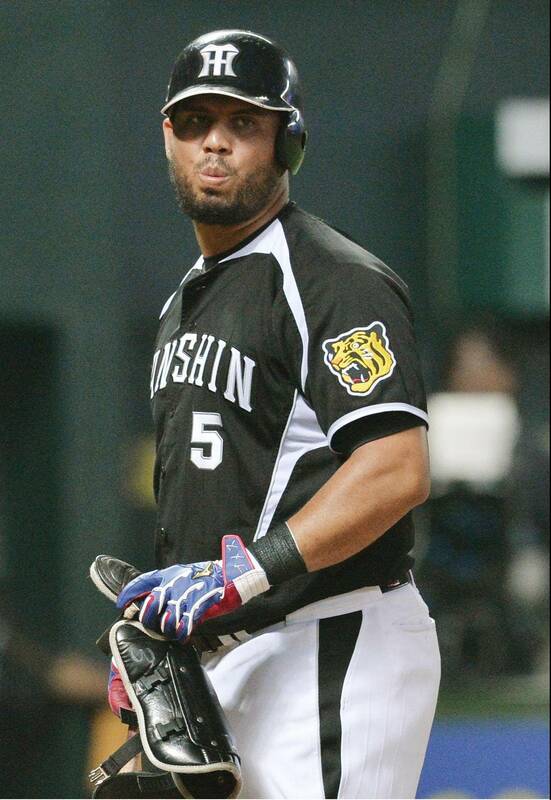 Nakamura finished 2-for-5 with three RBIs. He singled in his first at-bat and came away empty his next three times up before his dramatic game-winner in the 10th. “I stepped to the plate thinking I definitely wanted to get a hit because I hadn’t been able to come up with results previously,” he said. The Softbank bullpen kept the game close after starter Kenichi Nakata struggled with his control. 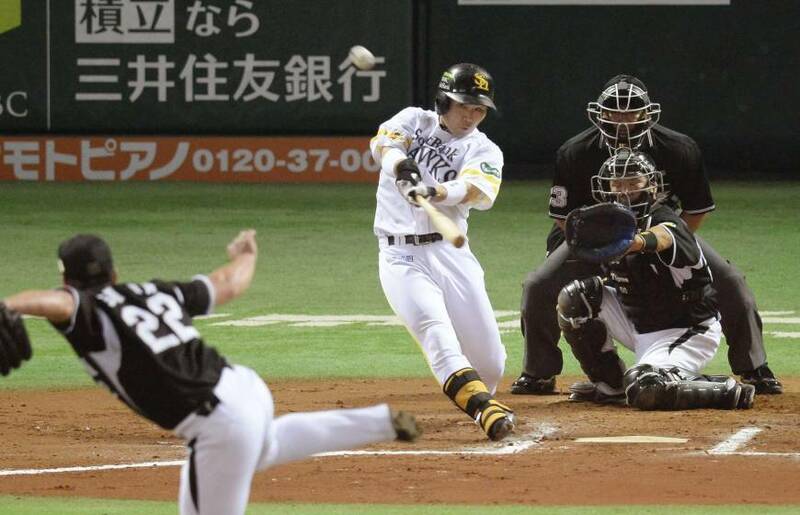 Nakata allowed both Hanshin runs and was out of the game after walking six batters in three innings. 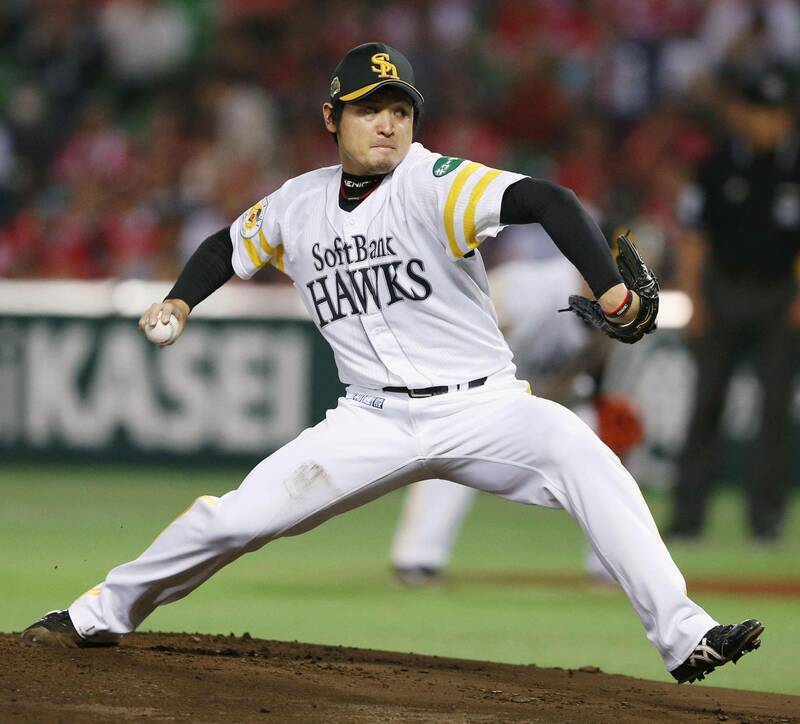 The Hawks’ Nao Higashihama tossed three scoreless innings of relief in his Japan Series debut, Yuito Mori threw one inning and Ryota Igarashi kept the Tigers off the board in his two frames.